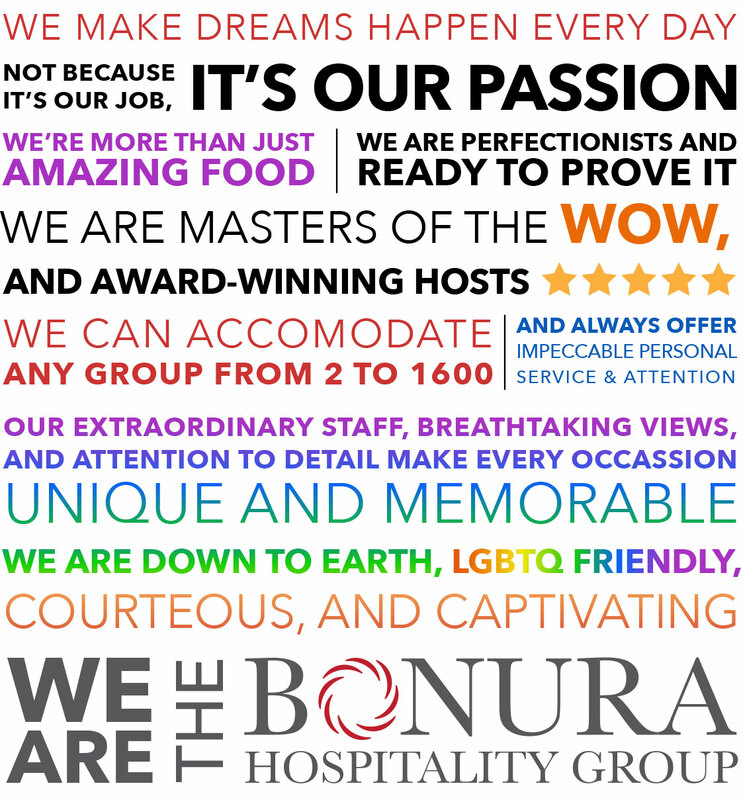 For over forty years, the Bonura name has been synonymous with outstanding food and exceptional service. The journey began in 1972 with a Perkins Pancake House in Newburgh, NY. In five short years, there were a total of six Perkins that were shortly followed by Mr. B’s, a Steak and Seafood Restaurant. In 1982, the focus of the Bonura Hospitality Group shifted dramatically away from ala carte dining to the event business. One-by-one, the Perkins were sold to finance the expansion of Anthony’s Pier 9, the largest event facility in the Hudson Valley. It began as a 5,000 sf. seafood restaurant on one acre. By the early nineties, it boasted nearly 70,000 sf. on over thirty acres. Since then the entire facility has been redesigned to keep up with the ever-competitive event industry. In 1994, BHG purchased the failing Radisson Hotel in downtown Poughkeepsie, NY and in under a year created a wildly successful catering and event hotel, now operated as The Poughkeepsie Grand Hotel. After the hotel, ala carte dining came back into the fold for BHG with waterfront redevelopment. In 2001, Torches on the Hudson opened on the Newburgh Waterfront. After a drawn-out RFP process, BHG was selected to redevelop the Poughkeepsie Waterfront as well. In 2006 and 2007 respectively, The Grandview, the Hudson Valley’s most luxurious event venue, and Shadows on the Hudson, a large eclectic restaurant opened. In 2012, BHG got into the country club business when it purchased the failing Orange County Golf Club in Middletown, NY and created the all new West Hills Country Club. West Hills is one of few country clubs in the area trending positive with growing membership and a booming events business. BHG has since continued to grow. In 2015 BHG closed the doors of Torches on the Hudson to make way for the most elegant restaurant on the Newburgh Waterfront. After extensive renovations, BHG opened the doors to Blu Pointe, a luxurious farm-to-table style restaurant boasting a temperature controlled walk-in wine room, blue stone fireplace, cozy indoor and outdoor lounge, and much more. Most recently, alongside the city of Poughkeepsie, BHG has begun a massive revitalization effort by constructing luxury apartments with spectacular views of the Hudson River. Water Club | Luxury Living, which opened its doors autumn 2016, offers one, two, and three-bedroom apartments with amenities that match and exceed the level of hospitality BHG is known for. All apartments include outdoor balconies, panoramic windows, stainless steel appliances, indoor parking, outdoor pool with cabanas, outdoor fire pits, bbq grills, gym, dog park, roof terrace, prime location, and much more. Whether you’re looking for dinner for two, an event for two thousand, or anything in between, Bonura Hospitality Group is here with a perfect venue at the price point you want. Allow our family to cater to yours.